Hard copies available for sale at the NAi Booksellers webshop. During the period between April 2015 and July 2016, researchers from The Hackable City-project, and the project partners, developed a series of experiments in Buiksloterham, a neighborhood and brown eld redevelopment site in Amster- dam. Each of these experiments was tailored to explore a specific aspect of what we call ‘hackable citymaking’. We designed a city game that facilitated collaboration between local stake- holders involved in the development of the area. An app was developed to act as a knowledge platform for self-builders, we drafted a set of criteria to evaluate collaborative area development by building groups; and a game, and a playful workshop, were created that invited local residents to start thinking about the collective management of commonly held resources. The goal of this diverse set of experiments, or ‘design probes’ as we’d like to call them, was to gain insight in the challenges and opportunities for collaborative citymaking. Some of these probes can be understood as an initial exploration of tools that can be used to open up the process of citymaking. Others were designed as a process to provoke discussions and reflections on collaborative development. Together they informed our research on what we started to call ‘the hackable city’: a city in which new technologies are employed to open up urban institutions and infrastructures to systemic change in the public interest. Could this vision be realized? What roles can citizens, professionals and policy makers assume in this process, and what tools and frameworks are needed? In Cahier #2 Design Probes for the Hackable City in Amsterdam Buiksloterham we share lessons learned from these processes. The focus is on practical insights, and their implications for design. A more abstract hackable city-model, based on our explorations in Buiksloterham, is described in greater detail in Cahier #1 The Hackable City: a model for collaborative citymaking. In addition, Cahier #3 The Hackable City International: lessons from Athens, Sao Paulo and Shenzhen presents findings on related practices in citymaking in these three major cities. The neighborhood Buiksloterham, in Amster- dam, is an interesting test-site to explore hackable citymaking practices. Buiksloterham is a historic industrial site known for its shipbuilding wharves and smokestack industries. By the 2000’s much – although by far not all – industrial activity had relocated, and plans were introduced to redevelop the site into a combined working-living quarter, including at least 9,000 houses and apartments. However, in the wake of the financial crisis of 2008, the traditional Dutch top-down developerled model used in Buiksloterham came to a halt. Developers pulled out, and many lots were left undeveloped, with hardly any takers interested. This created opportunities for alternative approaches toward development. A number of lots were reassigned for development by individual self-builders or by collaborative building groups, thus opening up the development of the area to new parties. On one lot, a small number of professionals launched an experimental site for investigating the circular economy. Partly inspired by its success, a larger network of residents, institutions and companies formed around the vision to collaboratively turn Buiksloterham into a ‘Circular Neighborhood’. The local government stated in its zoning plan their ambition to re-develop the neighborhood ‘organically’; and co-signed a manifesto that called for the circular development of the area. This entailed a small (local)-scale closed loop re-use of various resources, including water, energy, building mate- rials, etc. 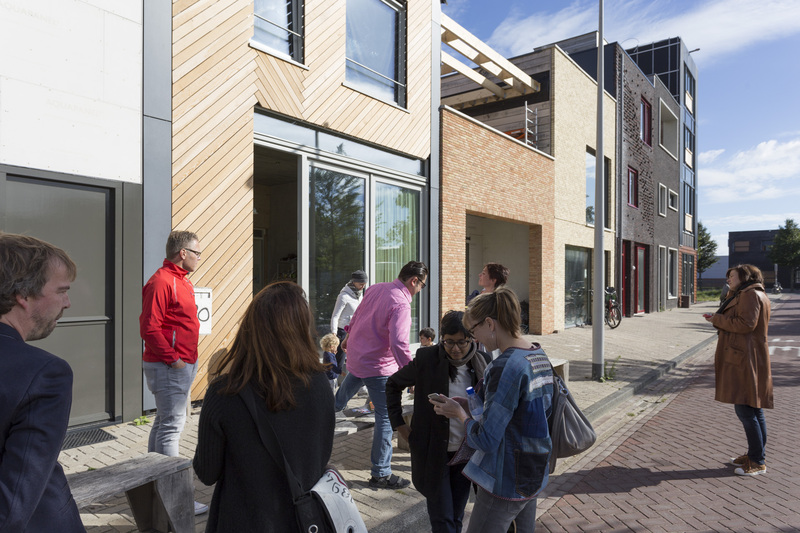 Local stakeholders started to envision Buiksloterham as a ‘living lab’ – in which new models and technologies for a circular economy, as well as cooperative development, could be tested. Two of our research partners were already working in the area. Architecture and urbanism practice One Architecture was an active agent in developing Buiksloterham via a collaborative building group, and at the same time were making plans to build a bio-refinery. Stadslab Buiksloterham (Citylab Buiksloterham) was another local partner interested in creating sustainable models for cooperative development. Our project was additionally supported by the Ministry of the Interior, and Pakhuis de Zwijger; two institutions also interested in exploring alternative, collaborative visions for citymaking. Research themes: (collaborative) self-building & area development,and water & the commons. To bring focus to our research on hackable citymaking, the team decided to concentrate on two issues: (collaborative) self-building & area development, and water & the commons. Both themes were prominently discussed in the local community by stakeholders. At the same time, these topics also provided two different perspectives on a central hackable city theme: the organization of collectives around private, collective and public value creation. Self-building starts as a private interest, and then often evolves into a collective one – and could contribute to, or even be in conflict with public values. Self-builders and collaborative building groups may organize themselves in order to empower themselves, or collaborate around issues like foundation pile driving, renewable energy provisions, or the management of public spaces. They experiment with innovative building methods that have the potential to bene t society at large. How can these lessons be shared with a larger community, and how can their contributions to public values be recognized, valued and stimulated? On the other hand, water management is an issue that is usually understood as a public utility, for which the municipality is responsible. In this case, there is little need or motivation for individuals or collectives to organize around water issues. What happens when water becomes understood as a (circular) collective good – a ‘common pool resource’? Collective goods are frequently subject to what is known as the ‘tragedy of the commons’ (private gain, collective pain). However, by investing in circularity, individual initiatives easily face an inverse version of this tragedy (private pain, collective gain), thus de-incentivizing such investment. This happens, for instance, when individuals invest in making their own house ‘rainproof’, e.g. by retaining rain water through the construction of green roofs or water tanks. This is usually a private investment, but everyone in the area bene ts. Under what conditions and provisions is it conceivable that citizens initiate and contribute to these types of collective and public goals? We deployed a number of established academic research methods, including ethnographic observations, interviews, and discourse analysis of various documents published by local stakeholders. These helped piece together a broad overview of the area, it’s issues, it’s stakeholders, and their interests. In addition, we employed new approaches based on designing small interventions through which we aimed to test a number of assumptions about collaborative citymaking. These interventions also helped provoke a debate about some of the central issues. This allowed us to become active agents within the setting itself, and reflect on this directly, rather than assume a disengaged academic stance, by pretending that our presence did not influence the field, and outcomes. By locating two ‘embedded researchers’ at One Architecture, we could observe developments up close, contribute to the development of tools needed for collaborative citymaking, and reflect on the larger organizational implications and shifting roles and relationships between citizens, professionals, and government. and help shine a light on the solutions that could be used to bring that preferred state about. In our case, this approach helped us understand the needs, interests and perspectives of various 2 stakeholders (understand the ‘problem space around collaborative citymaking), get insights in concrete tools that they could use to collaborate (possible solutions), as well as catalyze further discussions on the guiding principles for a hackable city (the preferred state). Two methods were specifically inspirational for us. The first is ‘cultural probing’, an idea introduced by Bill Gaver and his colleagues at the end of 1990’s. Cultural probes, Gaver writes, form ‘a design-led approach to understanding users that stress empathy and engagement. They can be objects, games or procedures that may seem estranging at first, but exactly because of this, they help to tease out responses. The goal is not so much to design solutions for current user needs, but to bring about new perspectives on the use of technology; it’s functionality, aesthetics and politics. In other words, the designer is a provocateur who invites participants to start imagining futures and their implications they hadn’t considered yet. 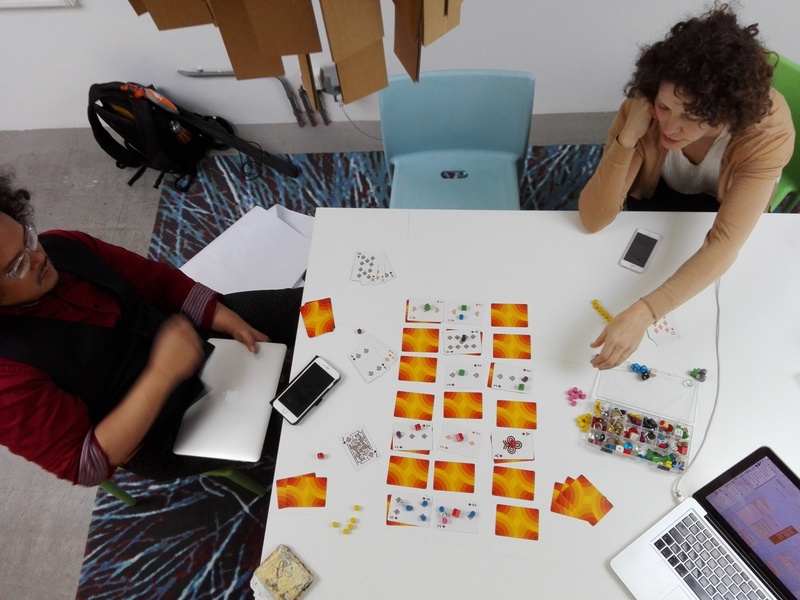 From this perspective, the designers and researchers in our project have created three different games, or playful settings, in which particular aspects of the hackable citymaking were translated into specific sets of rules. In turn, these games were introduced as ‘probes’ to stakeholders in Buiksloterham, and the feedback we received from them was used in the re-design of some of these games. This way, these game-probes operated on three levels. First, they provoked stakeholders in Buiksloterham to discuss their practices of collaborative citymaking. Second, they forced the researchers to reflect on the underlying structures and principles of hackable citymaking that they formalized into game rules. Thirdly, the games themselves can be understood as prototypes for tools that could also be used in processes of collaborative city- making elsewhere. Our designs for The Water Game, Walking on Sunshine, and Play the City Buiksloterham were based on these principles. These games provided us with insight into how stakeholders were, or were not, collaborating towards common goals, what kind of recognition they sought, how they interacted within government frameworks, and what attitudes (in general) they held towards collaborative/collective citymaking. Two other probes were developed to explore parameters for concrete tools to be used in a hackable citymaking process. The International Building Exhibit Buiksloterham derived from a research question about the organization of knowledge exchanges in open innovation systems. The Metrics & Indicators for Collaborative Building Groups explored a set of indicators that could be used to weigh collective and public interests in bottom-up area development. Together, these research methods, and the probes resulting from them forced us to continually iterate between an ideal model of the hackable city, and the concrete tools, games or probes that helped both us, and local stakeholders imagine it concretely. Step by step, we developed our model, while at the same time continually refining the methods and tools we were designing in the process. This cahier contains more detailed descriptions of our design probes, and the insights we gained from them. Given the limited time and scope of this research project, we ask you to understand them foremost as explorations that outline the contours for a hackable city. We find these contours promising, and urgent enough to develop further. We happily share our findings with you here, for further discussion, and perhaps further collaborative development in the future.